Georg Jensen and his creations are credited with having left an immense imprint on the landscape that defines modern living. This book gives more than a few answers as to the why. With an idiosyncratic approach and a focus on keeping the balance between form and function, his diverse ranges of both extraordinaire accessories and everyday objects have not only managed to keep pace but also exert influence of the ever shifting culture that defines lifestyles while at the same time managing to embrace a large spectrum of customers, from design aficionados to ones that “just like” what Jensen’s emissions do and how they look. A maverick that believed in his vision and a torchbearer for Scandinavian design at large that finds homage to him in this book. The focus is on his silver works but the book also covers his visions for the modern home informed by innovation and the incorporation of a range of different materials – a bit of a counterpoint to the furniture heavy Danish design landscape, which it is usually praised for. 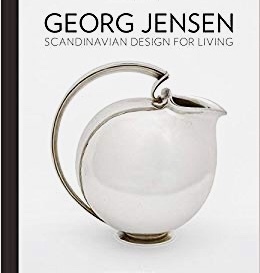 The book also pays tribute to the designers that keep pushing the envelope under the banner of the brand Georg Jensen, e.g. Sigvard Bernadotte and Johan Rohde, who took the DNA of Jensen’s oeuvre, incorporated new methodologies and infused his trademark style with their own flavours. Furthermore his collaborations with other designers, and architects are shed light on, which gives his works another dimension as they incarnate in different, seemingly unrelated contexts. A lavishly illustrated tome that rests on a solid foundation of elaborate essays that document how a Danish identity was coined in the realm of design – an identity that eventually found its place on the firmament of global culture and became a hallmark in the canon of twenty-first century design.